After six weeks of aircraft modifications, he proceeded to execute to completion the USDA 2005 and 2006 National Agriculture Imagery Program utilizing Leica ADS-40 aerial photogramic equipment. Later to be referred to by the private sector as Google Earth. TR's successful and on time completion of the USDA's six month, $7.6M National Imagery Program (NAIP) transitioned into several additional FAR Part 25 aircraft management opportunities with varied Part 91 operational diversities. As of 2012 he has performed over 1,000 US Customs and Border Protection aircraft re-entry clearances back into the U.S.A. and flown as PIC over 1 Million nautical miles within the Bermuda Triangle alone, all without incident. TR grew up in an aviation family and has flown consistently since the age of one month when his father, Richard flew his wife, Faith and newborn son to Florida from their home in New Jersey aboard the family's first aircraft, an M20 Mooney. As the years passed and more brothers and a Saluki arrived, TR's father purchased a Cessna 210 Centurion N30326, which became the airplane TR formed much of his early aviation knowledge in. After 40 years of being a student of aviation, TR is thankful for an incident, accident and violation free career. One of his more memorable flights took place in a Lear 55 when one of the left tire rims separated during takeoff. 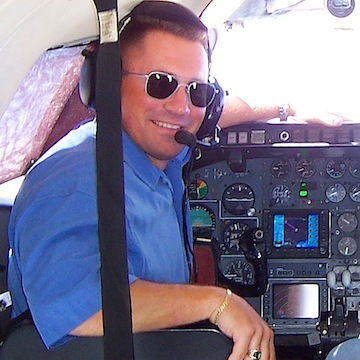 TR became a Flight Instructor back in the 90's while working as a line Capt, flying 14 CFR Part 135 for Steve and Joann Bean and their company, Mountain Air Services of Rangeley, Maine. At the time, MAS was a favored Summer destination for many Pilots who were seeking the addition of a Single Engine Sea (SES) Rating to their Pilots Certificate. Teaching flight students the art of water flying is one of TR's most favored past-times. TR claims that he loved his job at Mountain Air so much that he would still be there today if it wasn't for the loss of his Mentor, Steven A. Bean, in the company's Super King Air B200, N30EM one snowy Christmas Eve. TR can often be heard recounting to his flight students and copilots alike that the event of Steve's passing at 15,000 flight hours is a strong reminder that no Pilot will ever have enough experience to overcome the complacency of permitting distractions to enter the cockpit.